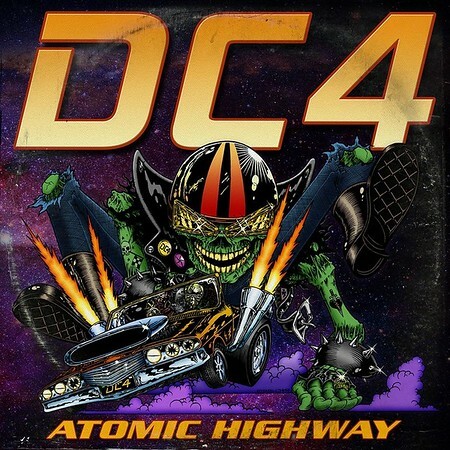 “Atomic Highway” is the latest album from American band DC4 and it was released on 21st September via HighVol Music. The Californian based band features three brothers and the four musicians are, or have previously been, members of bands such as Armored Saint, Dio and Odin. This is the band’s fourth full length studio album. The track “Something In My Head” was included on the Friday NI Rocks Show on 19th October. DC4 was formed in 1997 by three brothers – Jeff Duncan on lead vocals and guitar, Shawn Duncan on drums and Matt Duncan on bass. Jeff has been a member of Armored Saint since 1989, whilst both he and Shawn were members of Odin from 1980 to 1990 and were later involved in the re-unions in 2003 and 2011. Initially the three brothers were joined by guitarist Hyland Church, but he was later replaced by Rowan Robertson who had been part of Dio’s band from 1988 to 1991. Those four have been together ever since. The band released a five-track EP called “Mood Swings” in 1997 and their debut album “Volume One” in 2002. Both of these featured Church on guitar before he was replaced by Robertson. The second album “Explode” was released in 2007 and was followed by “Electric Ministry” in 2011. There are 10 tracks on “Atomic Highway”, including a cover of The Who’s “Baba O’Riley” that features guest appearances by John Bush from Armored Saint and Dizzy Reed from Guns n Roses.